Owning big homes with a garage is a responsibility itself. Those who do not have one want one and those who already have them, wish to maintain it in the easiest way. Having a garage in this real estate world is not very easy and maintaining it is not a piece of cake either. Garages have a lot of space if you figure out how to utilize it. Besides parking your car, there are a plethora of other functions for a garage. Most important one is storage. You can store all the items here that do not fit inside your house or do not go with the vibe of it. Gardening equipment to plumbing tools, all can be quite conveniently stored here. All of the items that fall into these categories can be put in there and can be found in one place later when you need them. This article is going to help you make the best use of your garage space and how to make sure you are not wasting or cluttering this blessing of a space in your home by listing out 5 ways to do so. We all have cabinets in our kitchen and we are so used to them that we cannot even imagine a kitchen without cabinets. If we ask you to build a kitchen in your head without cabinets, you will probably not be able to do this. Why is it that our kitchens are so abundant in storage cabinets? Well, it is because there are plenty of things to store and you cannot put them all on your shelves in the open. Also, the items available in the kitchen are of such different variety that they need separate spaces for storage. Now if you look at it, garages are not really that different from kitchens in this regard. The stuff that needs to be stored in a garage has also different ranges and need to be put somewhere safe. This can be done through installing storage cabinets in the garage as well. You can choose your favorite material, the cover sheet of your choice and design it in accordance with your need and aesthetic appeal. Having storage cabinets changes the look of your garage entirely because the stuff is stored and arranged inside without making a mess on the outside. And let’s face it, even if it turns into a mess at some point, the doors will conceal it. You may think that storage cabinets and shelves are alternatives to each other but in reality, they both go hand in hand. A place with only storage cabinets and no shelves is quite pointless. Sometimes, you need to put stuff in plain sight and for that, shelves are your best option. The kitchen reference extends here as well. Moreover, these shelves come in very handy when you are doing a project and need to have a supporting base for it. You can also use it as a tray for putting tools when fixing your car. Also, more shelves mean extra storage. Shelves can be made aesthetic as well by choosing the right material and the right design. 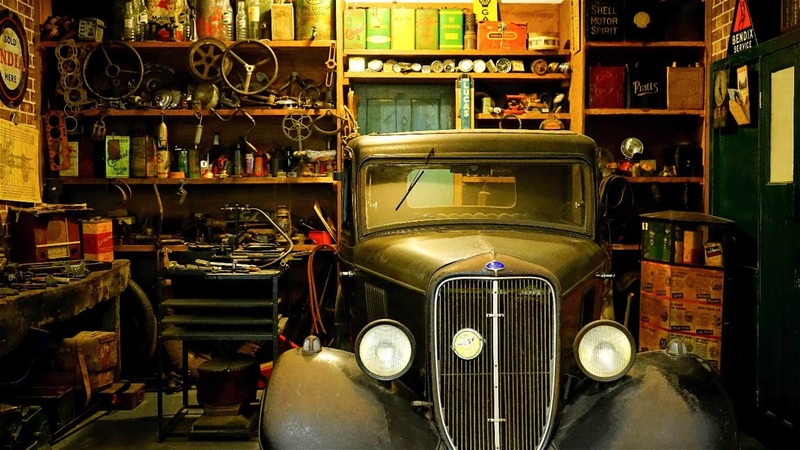 Arranging tools on the shelf can also give a garage-vibe to the place which is very vintage and alluring. Now that you are done with your shelves and storage cabinets, turn to the walls for extra storage capacity. You are obviously not going to install cabinets all around the garage on four walls. So, use the rest of the walls to hang your pegboards and hooks. Pegboards help you use the holes for items that have sharp edges. The sharpened ends can be faced towards the wall and stick on the board. This way, you cannot hurt yourself while picking them up. If you put these items in the cabinets instead, you have the possibility to hurt yourself every time you search for tools. So, it is better to be safe than sorry. Hooks can be utilized to hang hoses or pipes that take up too much of space in cabinets or are too delicate to be stored with other tools. Both of these save a lot of space. You can choose the sizes of these as you like and can also go for a stylish design to enhance the look of your garage. Another clever idea to make space is to install foldable work benches. You can unfold them in the length as you like and work on it. Once you are done, you can fold the bench back towards the wall and free up the space that you had taken up during your project. This can also be taken as an alternative to shelves as they are rigid in their places unlike these benches which can serve as shelves but can free up the space when needed as well. It is like a perfect two-way solution for your garage. You can make as many segments to unfold as you like in the bench in accordance with your need and open the length you desire whenever. You can be creative and on a budget as well. You may be thinking that the ceiling is used for installing door openers, that okdiscountgaragedoor.com installs, but once you consider using the ceiling for storage, you will be able to see how feasible and efficient it actually is. You can install robust hooks and hang your stuff from there as well. This may work very well in your favor and save you a lot of space. However, you need to be careful about who hangs the stuff and how do they hang it because it may be quite a safety concern while standing beneath it. You can hang umbrellas, some ropes or other light things there to be safe and smart at the same time. So, these are the ways you can enhance the storage system of your garage. We hope you find them helpful and actually use them in your garage.